HOW CAN WE HELP WITH YOUR APPLICATION? CONTACT US AT (800) 592-2050! 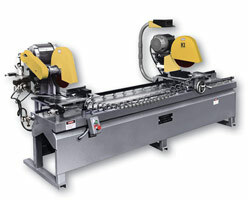 Kalamazoo Industries Inc. non-ferrous industrial saws are for cutting aluminum, brass, plastic , wood and any non-rusting material using a carbide tipped blade. 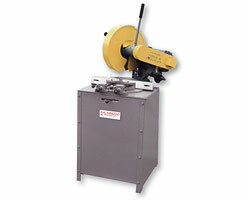 We offer straight cut non-ferrous saws along with mitre cutting non-ferrous saws with blade diameters from 10” – 14”. Also saw heads less base can be adapted for special customer designed machines. 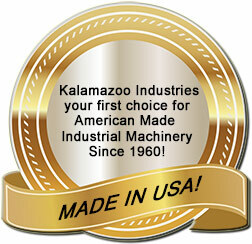 Kalamazoo Industries Inc. non-ferrous industrial saws GREAT for non-ferrous metal foundries, machine shops, welding/fabrication shops and home work shops that cut a lot of non-ferrous parts (such as aluminum that goes into producing windows). These high speed non-ferrous industrial saws cut metal quick with little to no heat build up, so your parts can be safely handled. K10HS/KM10HS spindle speed is around 3450. KM14HS, HSM14 and HS14 spindle speed around 4400. 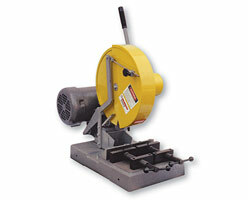 The clamps that we use for this saws are jawed vises. 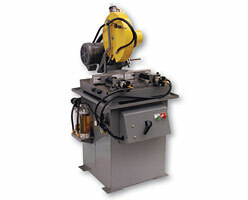 Optional metered drip unit available for these high speed non-ferrous industrial saws. 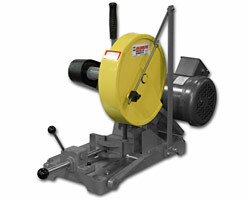 Contact us at (800) 592-2050 for price for this units. 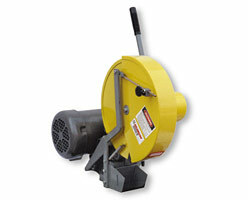 Motor Options: 3HP up to 5Hp. INDUSTRIAL ABRASIVE CHOP SAW YOUTUBE CHANNEL! INDUSTRIAL BELT GRINDER YOUTUBE CHANNEL! INDUSTRIAL BELT SANDER YOUTUBE CHANNEL! INDUSTRIAL HIGH SPEED NON-FERROUS CHOP SAWS YOUTUBE CHANNEL!